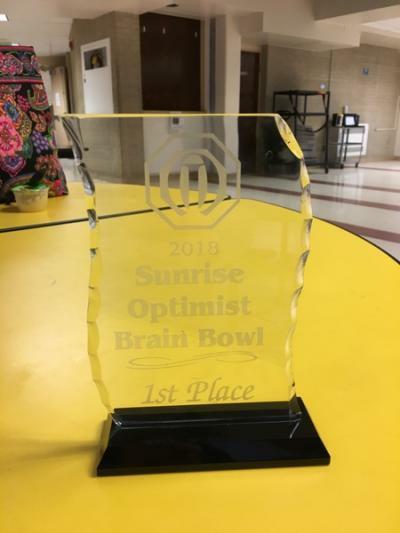 Akron Schools sent 3rd through 6th grade students to Fort Morgan to compete in the Sunrise Optimist Brain Bowl. The school is extremely proud of all the students who competed! One of the 5th & 6th grade teams competing in their division placed first in the competition. 3rd & 4th grade team - Addison Weis, Caleb Hansen, Brigid Ardrey, Mikenna Weers, Zach Bowin, and Kashlee Randel. 5th & 6th grade teams - Anderson Filla, Caitlin Dunbar, Zaya Wells, Tyler Murphy, Alex Bowin, and James Vorce; Shon Butz, Caleb Poss, Merek Charney, Haylee Roseberry, and Carl McGuire.